I just returned from a great trip to Ireland with my good friend and indispensable barn manager/trainer, Jineen Reed. It was half business (horse buying) and half vacation. Here is an account of some of our Ireland travel adventures. We flew out of Dulles on the evening of Sunday, July 6. We had to change planes in Newark, NJ. We realized at the airport that we had forgotten the torch (Irish for flashlight)! Since this is an item that is important for exploring castle ruins at night, we purchased one in the airport. As you will see, it turned out to be very handy later on! We finally left Newark after sitting on the runway for over two hours while they fixed the brakes on the plane. We arrived in Ireland Monday morning, jetlagged as usual after the all-night flight. I collected my reserved rental car, which proved to be quite a smart little brand new maroon Focus. It only had 46 kilometers on the odometer! 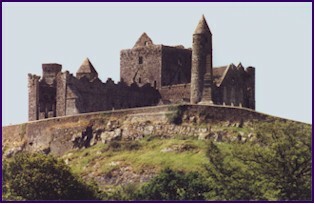 We drove to the town of Cashel, in County Tipperary, where we normally base during our horse-hunting expeditions. As always, I was awed by the sight of the Rock of Cashel; that huge and magnificent castle built nearly a thousand years ago, sitting high on a hill above the town. I never get tired of that view! We had made arrangements to stay at the Derrynaflan B&B. I have stayed here several times before, and it starts to feel a bit like home. After tea and scones, compliments of Mrs. O'Sullivan, we had a nap for a couple of hours since we were exhausted. In the afternoon, feeling somewhat refreshed, we met our friend Clare, and went with her to look at some very nice horses at a nearby yard. Clare was kind enough to cook us a lovely lamb dinner; and then, still sleep deprived from the flight, it was early to bed. As our first appointment to see horses wasn't until 11:00, we decided to visit Grallagh Castle in the morning. This was the castle that I had visited last summer with my sister and my mother, and we were able to climb to the top of it. (See Ireland July 2002) It was one of the high points of our trip last year, but Jineen had not been with us then, and she had never been to Grallagh Castle. To our great dismay we found a gate of iron bars padlocked and blocking the entrance to the stairs, so though we could enter the castle on the ground floor, we could not go upstairs. We were disappointed, as Jineen had not had an opportunity to go up a castle of this type before. We decided that the landowner had probably seen Mom's gray-haired head sticking out of one of those high windows on the top floor, and had hurried straight to the nearest hardware store for a lock! We went on to the town of Fethard to visit the tack shop, where we were to meet Clare. I wanted to buy a pair of loop-style racing reins as a gift for Melissa, who was in charge of the farm at home while we were gone; but unfortunately they didn�t have any in stock; the reins were due to arrive the next day. Since our shopping attempts were unfruitful and it was still early, we set out to explore the town a bit. Fethard is a very interesting little town. When the town was built, probably back in the 1500s, it was totally surrounded by a very high strong stone wall. Originally enclosed within the protecting walls were a castle, a church and cemetery, and pretty much the entire town. Now the town has grown and spilled outside, but you can still see the huge stone wall, about 25 feet high, surrounding a large closed-off area where the old Edmunds Castle and an ancient church still stand. 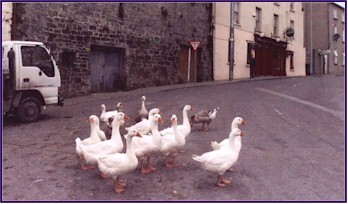 Looking down the street, we were struck by an interesting scene: a flock of about a dozen geese, hanging out in the middle of the street in front of the old castle. We observed them for quite a while; they seemed to live there right by the castle door. When a car or lorry would come along they would squawkingly move to the side until it passed, and then move back to their preferred spot. We were wandering around peeking through doors and windows, trying to find a way to get in to the old churchyard in the walled-off area, or at least looking for a spot where we could see in. The walls looked pretty unscaleable, and we could only catch mere glimpses between the gaps in the stone. About that time a young boy who probably lived near the geese came by, and told us that if we went up to Mr. Whyte's store he might let us in to the walled churchyard. We walked up to the store and inquired within, and sure enough Mr. Whyte unquestioningly handed us a key ring with about six keys on it. I figured it was probably the keys to his shop, his car, his house, and of course, the keys to the castle. Only in Ireland! One of the keys let us through the huge iron barred gate, and we explored the cemetery and old churchyard. There were gravestones as recent as last year, and others so old that the engraving was completely worn away. The huge protecting wall was very strong and thick, and there were steps up to a ledge you could walk along just below the top of the notched wall; here is where the knights and archers would have stood to defend the town! Part of the church looked more recently built, and in fact they still hold services there, but there was a very old ruined part with no roof that was intriguing. A door of iron bars blocked our access to it, so we stood looking in through the doorway. We couldn't see any lock, but the bars seemed to be set in the stone somehow; we repeatedly pushed as hard as we could on them to no avail. Jineen said, "It looks like it should open if you just pushed hard enough," and she gave it a token shove with one hand. Miraculously, the door just swung open! So in we went. We found this section of the ruined church especially appealing, with the grass and wildflowers growing up tall and wild around the ancient gravestones. When we were finished exploring, we returned the keys to Mr. Whyte's store and went off to several yards to look at horses. Going around Ireland to look at horses is one of my favorite things to do. When we arrive at each stableyard, first they stand each horse up for us in hand, and then jog it in the roadway. I take a photo of each horse, and Jineen takes careful notes. This is essential, because we generally see at least forty to fifty horses on each trip, and it is important to keep track of the details. We decide which horses we want to see go under saddle, and then if I see something I really like, I ride them myself. There are lots of horses for sale in Ireland, but many of them do not meet my standards. We choose only the really elite and special to bring home! On the way back towards Cashel with Clare, we stopped off to visit Van De Vater at his lovely home, Peppardstown. Van is a longtime Eventer, Dressage Judge and Instructor; he is very well respected in the Eventing world. He asked us in for a glass of wine, and gave us a tour of his lovely gardens and house. He showed us his fabulous collection of paintings and art, and regaled us with some amusing stories. We enjoyed his company thoroughly! Then it was time for dinner and a pint of Smithwicks at Hannigans Pub. Their garlic mushrooms are to die for! After dinner, we decided to visit the Chalice Castle. One of my favorite things about Ireland is all of the castles. There are the big and grand and famous ones, and these are great, and not to be missed. But I am in love with the small 'everyday castles' that you see in farmyards and cow pastures all over the country. The Irish people take them for granted as they are so common, but Jineen and I are absolutely fascinated by them. The sense of history and timelessness I get from standing in a structure built six to eight hundred years ago is incredible. 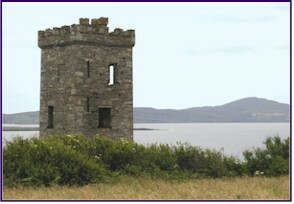 These smaller castles are square of design, and usually five or six stories high. The upper levels are generally reached by climbing a steep spiral staircase of stone that winds its way up through a narrow round tower on one corner of the castle. They are designed for protection more than comfort, with walls of stone eight feet thick and thin vertical windows that you could shoot arrows out of (but hopefully not in to). These small fortresses were built to withstand the ravages of war as well as the ravages of time. Chalice Castle is just such a place. Jineen and I were drawn to revisit this place. We set off at about eleven o'clock at night: Ireland being so far north, it is light very late in the summer, so it was just twilight by then. And this time we came with a torch! Getting there was a challenge from the first. 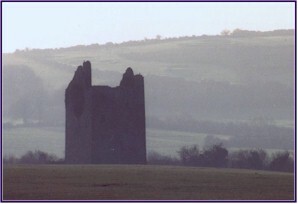 We parked by the main Cashel-Dublin road and walked across the fields toward where we could see the castle looming in the moonlight. But we soon came to a large stream with an electric wire sheep fence on the other side. Since neither of us fancied swimming and we both have an electricity phobia, this made things a bit difficult. But eventually we found a culvert over the creek and a place where we could scale the fence, and made our way to our destination. The door, as in our previous visit, was barred and locked; but there was an opening in the wall of stone at the base of the building just big enough to crawl through. And unlike before, this time armed with the torch, we could find and negotiate the narrow spiral stairs. Up, up the winding stair we went, past floor after floor, until we came out at last on a narrow ledge on the very top of the castle. Oh My God! It was so awesome! We sat there on the top of the wall in the darkening night and looked out over the quiet fields in the moonlight. We stayed there until after midnight, imagining what it must have been like to be the sentry on duty on the top of that castle six hundred years ago. It was truly magical! We started off this morning with a great breakfast at Mrs. O'Sullivan's, sampling her homemade jams and Derrynaflan cheese. Then off to a horse show! Once again this year we attended the Future Event Horse League qualifier class at Chris and Sue Ryan's lovely home, Scarteen, home of the legendary Scarteen black and tan Foxhounds. Or at least, eventually we attended the show. We were navigating the way without Clare that morning, as she was to meet us there. We didn't do too badly, only getting lost three or four times, once before we had even left Cashel! The road and map system in Ireland is quite different from the one here. On the maps there are route numbers, but you rarely ever see these marked on the actual roads, only signposts toward towns. And sometimes no signposts at all! I have a great detailed atlas that shows every little lane and road, but figuring out where you actually are on that map is somewhat of a challenge! We wandered aimlessly around Tipperary Town for a while, reversing direction a number of times before finally following Carol Gee's horse box, only to find that she was lost too! But eventually we managed to find it. The show had a four-year-old class, and one for five-year-olds. The horses do a dressage test, and then jump quite a challenging outside course that combines show jumping and cross-country fences; including banks, water, a coffin, a narrow fence and combinations. The horses get a great education, and the class is designed to truly assess a youngster's potential for Eventing. The show was beautifully run and great fun, with Chris Ryan's commentating from the top of the bank jump keeping things lively and entertaining. He also rode several horses in the classes, so he had a busy day! This show is part of a series of qualifiers put on by the Future Event Horse League, with the final, sponsored by Tattersalls, in late September. I had attended the show last year, and I found that this year the number of really high quality horses participating had increased. I think it is a great program and a great venue for promoting the Irish horses; I would love to see a similar series here in the States! We went back to Scarteen in the morning to try out a four-year-old of Chris's that we had seen ridden in the show. I liked the horse quite a lot, and what fun it was to get a chance to jump around the course myself! We were successful in our navigation on this morning, miraculously making no wrong turns, though we were delayed for a while by a cow standing in the middle of the road, acting like she owned it. We met up with Clare at her house, and headed off for the Goresbridge Sale. While passing through the town of Fethard on the way, we saw the lady who runs the tack shop walking down the street. We stopped and asked her if the loop reins had come in, and sure enough they had. The shop was closed, but she opened it up for us, so I was able to get Melissa her reins after all! The Goresbridge Sale is a famous horse auction held several times a year. Many really successful horses have come through Goresbridge, but it is quite a gamble to buy horses like that at an auction, as you don't get the same kind of trial of them that you would trying them at the farms. We went more for curiosity than for shopping, and it was quite an experience. That day was not when the best horses were being sold, so most of the entrants we saw were not of the highest quality. But it was really interesting to observe the process! There is a sales catalog listing information on each horse. You can go back in the stables and see them in their stalls. Then an hour or so before they are to be auctioned, they are brought out and lounged over fences or ridden. You get a chance to see them move and jump a bit, but in a very small and crowded ring. Then they are led around in the sales ring, and the bidding begins. The auctioneer talks constantly, and sometimes seems to pull bids out of thin air; you can hardly ever actually see someone make a bid, they do it so subtly. I kept my hands in my pockets and was careful not to blink too hard while I was near the sales ring; I didn't want to find out I had accidentally bought a horse when I thought I was just scratching my nose. It was quite the three-ring circus! 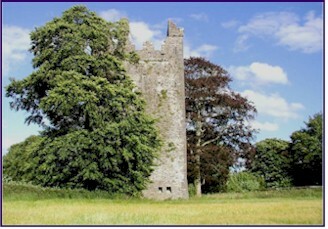 We were heading back from Goresbridge, and there in front of us at a crossroads, we saw a really nice castle with a round tower beside it. It was called Burnchurch Castle, and stood in a golden field of wheat. Unbelievably, Clare was going to just drive right past it; can you imagine? We put a stop to that, and made her climb up to the top of it with us! Jineen and I keep hoping our obsession with castles will rub off on her, but apparently we still have a ways to go. When we got up to the top story of the castle we came out on a walkway that went around the outer edge of the top story of the castle; but the floor was missing. There was a drop down to the stone floor several levels below, and the walkway was narrow and sloping; this did nothing to alleviate my fear of heights. There was a treacherous set of stones sticking out of the wall in a jagged row, forming a set of very narrow stairs, with several steps broken off and missing, leading up to the very highest peak of the roof. I looked at them and was amazed that they were left there; for the stairs were very dangerous, and I thought the foolhardy might be tempted to try and climb them. I then looked out over the parapet to the outside of the building, to the ground far below. Spurred by my acrophobia, I started to paranoidly imagine the stone ramparts I was leaning on crumbling away before me. Then I heard a noise and turned around, and there was Jineen, at the top of the roof peak, having traversed the hazardous narrow steps! I think she does things like that just to freak me out! We headed back towards Fethard again, a lovely drive with the Slievenamon Mountain looming majestic in the background. We returned to one of the stableyards we had visited earlier in the week to see a new horse that had just come in. It turned out to be an incredibly beautiful five-year-old by Master Imp! Then it was on to dinner and a pint at McCarthy's Pub. Another decadently delicious breakfast at Derrynaflan, and then we said goodbye, as we were heading towards the coast this day. But we assured Mrs. O'Sullivan that we would be back on our next trip! 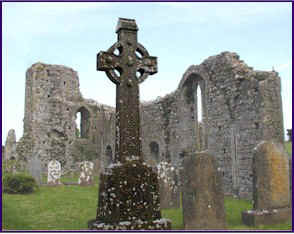 Upon leaving Cashel we stopped by the town of Golden and visited the Athassel Abbey. This was another of those absolute treasures that nobody seems to know about. There is actually a signpost for it in the tiny town of Golden, but when you drive down that narrow country road there is no parking area or sign pointing the way. 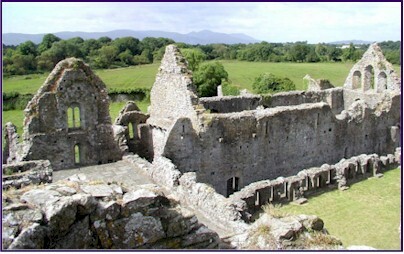 Then you see this majestic ruin of a large abbey out in a farmer's pasture! You can leave your car at the top of a little lane a ways past it, walk back up the road, climb over the stile in the stone wall, and make your way across the cow field and back into history. 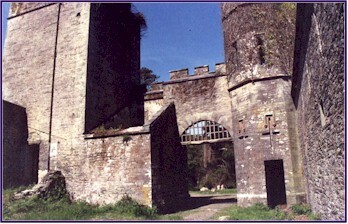 There is a beautiful archway and gatehouse where you enter through the remains of the protecting wall. When you enter the ruins of the Abbey itself you can explore from room to room. 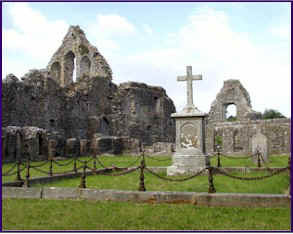 There are ancient tombs and graves, many of them marked with the beautiful Celtic crosses that are so typical of Ireland. The whole place had a very spiritual feeling; I think I can feel God in places such as this! The Abbey is open to the public, but several of the lower chambers had barred and locked doorways preventing access. At one such door the bars were spread slightly apart, just enough that we could squeeze through them. Oh Boy, what a find! This led to one of those great winding staircases, which brought us out to the top of a wall of one of the buildings of the Abbey. Here we could sit in this high place in the sunshine, enjoying a splendid view of the green fields of Ireland with the Galty Mountains sitting impressively beyond. Then we drove south, past the city of Cork. We stopped at a roadside stand along the way and bought some Wexford strawberries; they are incredibly tasty, we ate the lot. We came to the town of Bandon, where we visited our last stableyard of the trip, and saw several really nice horses. This completed the horse-hunting portion of our trip; all that remained now was to make some phone calls and complete the transactions on the two exceptional horses that I had decided to purchase. For the remaining portion of our trip we had made no definite plans or reservations. We had destinations in mind, but had left ourselves the freedom to follow our noses and let come what may. We had decided against making lodging reservations in advance, because we did not know where we would end up each day. From Bandon, we headed southwest, down to the coast. We pulled out the atlas and looked for anything that piqued our interest. We saw something called the Templebryan Stone Circle marked on our map, so we decided to find it. We made our way down many small lanes and roads, trying to figure out just where the stone circle was; or more to the point, just where we were! But as I observed often on this trip, the hunt is half the fun! Eventually we found the circle; it was a grouping of standing stones in an area about fifteen meters across. It was fairly modest, and even though it was surely quite an ancient place of worship, it was not really very exciting. We found it puzzling that something like this was on the roadmap, but some of the large and grand castles that we visited were not. Even though Templebryan was somewhat disappointing, we felt that we had not given stone circles a fair try yet, so we decided to aim for the Drombeg Stone Circle. Somehow we took a wrong turn, and ended up in the Castlefreke Woods! We saw a lovely castle in the distance, and started following lanes that seemed to head in the right direction to find it. And we ended up at the beach! We stopped in a little parking area, and walked up to the top of a bluff. Below us was a lovely sand beach, very secluded and quiet. There were a few people down at the edge of the surf, but since it was breezy and about 70 degrees, only the very brave were in the water. From our seaside viewpoint we looked back toward the hills, and there sat the castle. We once again set out to find our way to it. We followed a roadway back up into the forest, and parked by a gate with a large NO TRESPASSING sign. Studiously ignoring this, we climbed over the gate and walked up a wooded path, and that is how we found Castlefreke! Looking on the grand structure, we decided it was probably not a very old castle, but a more recent building. It was obvious that some clean-up work was being done on it. There did seem to be some signs above the main entrance saying 'dangerous building, no admittance.' So we entered through a side door and started to explore! We were intent on our discoveries. We were in the process of going from room to room, peeking in the nooks and crannies, when suddenly we heard someone speak. "I'm sorry, but this is considered a dangerous building, and there is no admittance," came a polite voice. A man was peering into the window. "I'm afraid you will have to leave," he said graciously. I was amazed at how nice and polite he had been, considering he had just caught us trespassing. I was about to slink away, but Jineen decided to go talk to the man and ask him about the castle. And we got the grand tour! The man turned out to be the caretaker; his name was Willie Joe Hayes, from the town of Owenahincha. We followed him out of the building and approached him to express our curiosity about the history of the castle. He seemed genuinely pleased that someone was so interested, and though he clearly didn't believe our (false) story that we hadn't noticed the signs denying admittance, he was willing to answer all of our questions and tell us the history of the house. We found out that Castlefreke was built in 1820. It is technically a stately home or country estate, not truly a castle. A man named Evans-Freke originally lived on that spot, in a more modest house. When he was granted a title and became the Lord Carbery, Evans-Freke approached Robert Morrison, who was apparently a famous architect of that era, and asked him to build him a home fit for a Lord. Castlefreke was the result! In 1888 a round tower was added to the corner of the house, in celebration of the 50th anniversary of Queen Victoria's coronation; it was called Victoria's Tower. Having earlier enforced the 'no trespassing' policy on the premise that the building was dangerous, Willie Joe then proceeded to give us a tour. He showed us some of the work he had been doing cleaning up the rubble and removing the ivy from the walls. He took us from room to room, explaining the use of each. We toured the stables, the large tackrooms, and the carriage house. He showed us how the ivy that had been practically covering the structure had grown so big that in places the vines were like tree trunks. He even showed us what was reportedly a haunted room! The story is that over a hundred years ago two young men had a duel, and the one who had lived in that room was killed with a sword. The local people had sighted his ghost in that room repeatedly over the years. Presently we left the Castlefreke Woods, and headed on to Ross Carbery. Eventually, we did manage to find the Drombeg Stone Circle. It was much more interesting than the previous circle. It consisted of about a dozen standing stones, and the place had a very ancient feel to it. There was a plaque explaining how on December 21, the two tall stones in the entranceway line up with a long horizontal stone on the opposite side of the circle, and with the spot where the sun sets on the horizon. At sunrise on that same date, there is a similar alignment with the horizontal stone and another portal between tall stones, to the spot where the sun comes up above the hills. I don't think anyone really knows for sure exactly what these stone circles were used for. They are definitely very ancient; many of them were probably constructed over three thousand years ago! They are thought to be some type of Druid religious site. Jineen and I had both read a very good novel a few years ago about a woman who was able to travel back in time by stepping through a portal in such a stone circle. Jineen tried it, but she wasn't able to make herself disappear into the past; perhaps the alignment with the sun wasn't right. We continued on to the town of Glandore, right on the water, where a boat regatta was in progress. There were hundreds of sailboats in the harbor, preparing to race. We watched for a while, and then went on to Unionhall for some very good fish and chips. Then we started looking for lodging for the night. This turned out to be more difficult than we had anticipated, as it was Friday night, and all of the B&Bs we inquired at were full. After several unsuccessful attempts, we found a lady who was willing to phone ahead for us, and we secured a room at a place called the Hillcrest House. This turned out to be in the town of Anakista, out on the Sheep's Head Peninsula. 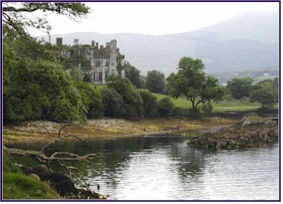 There are five peninsulas jutting off the southwestern corner of Ireland, all of them colored green on the roadmap, indicating National Parkland, even though there are roads, houses and towns within these park areas. The Dingle and Iveragh peninsulas are the two most northern ones, and the largest and most famous. (Indeed, last year I traveled the famous 'Ring of Kerry' around Iveragh.) The next one down is the Beara Peninsula, which was our intended destination. When I visited Kerry last summer, several of the local people told us that the Beara has everything the Ring of Kerry does, except the tourists. It was reported to be just as beautiful, but more remote and secluded. That sounded good to us, so our plan was to make for Beara. 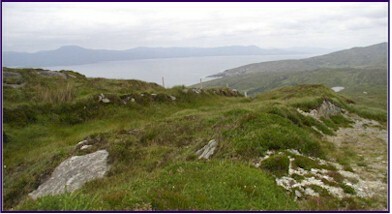 Sheep's Head Peninsula is just south of Beara, and the smallest of the five peninsulas. We hadn't really even considered going there; it looked insignificant on the map. But when we ended up finding lodging halfway out to the tip of the peninsula on Sheep's Head, it proved to be a lucky chance. And another good example of the advantage of not having anything planned too much in advance! Like my personal motto says: Invest in the Journey, not the Destination! This little strip of land sticking out into the Atlantic proved to be enchanting. We drove slowly along the shore, with water on our left and mountains on our right, enjoying the slow sunset and long twilight of the Ireland summer evening, listening to music from Riverdance and marveling at the scenery. We were so glad that the unexpected chance had led us there!